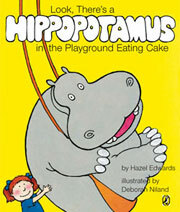 TITLE:"Look There's a Hippopotamus in the Playground Eating Cake"
Reading: On Imparja TV, Hazel reads this book to Yamba, for the indigenous themed book program. View here. The first day of school can be be scary, unless you have a friend. The hippo helps face all the important first-day-at-school experiences – meeting the teacher, eating lunch in the playground and making new friends. Starting school is one of childhood's major milestones. Reading this book in the year before starting school can reassure and build confidence in children before the big day.